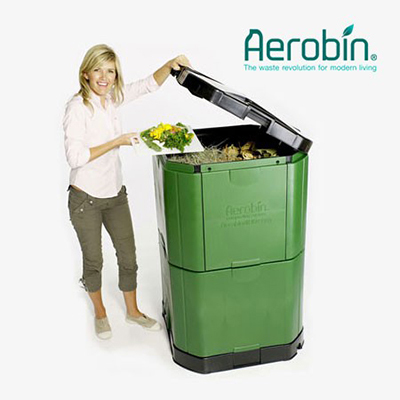 Aerobin 400 Compost Bin - Our Best Seller! 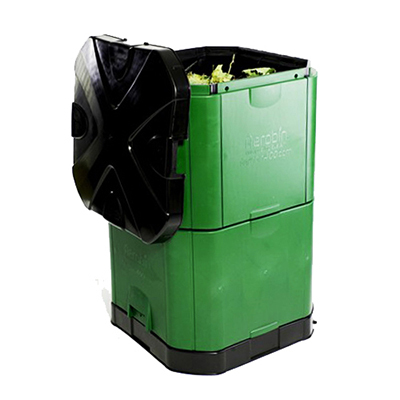 The Aerobin 400 uses a patented lung® or aeration core inside a sealed bin to promote aerobic break down of organic matter, which experts say is the preferable method to reduce greenhouse gas emissions. The thermal insulation in the Aerobin 400 conserves heat, leading to rapid breakdown of the biomass and works efficiently year round, even in cooler regions. 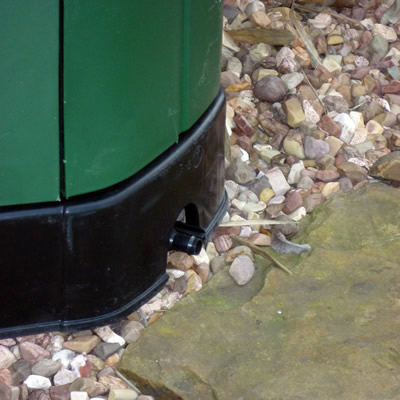 There is no need to turn the biomass and it is pet and rodent resistant. It has little odor and can kill noxious weeds and seeds. The Aerobin 400 is easy to use - just open, drop and close. 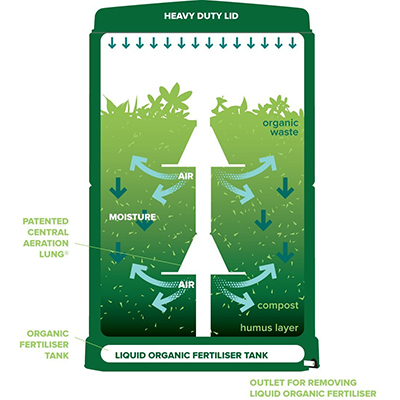 After a short time, fertile compost is produced, which is easily accessed via the lower side door. 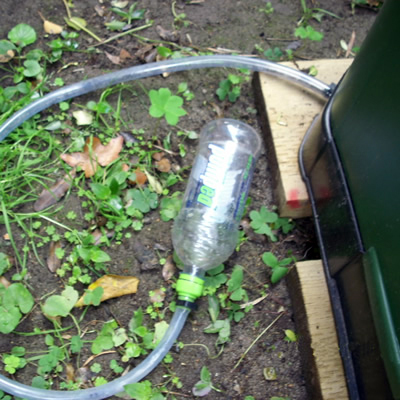 The Aerobin 400 comes with a reservoir at the bottom to collect the leachate, which when diluted makes for great "compost-tea" liquid fertilizer. 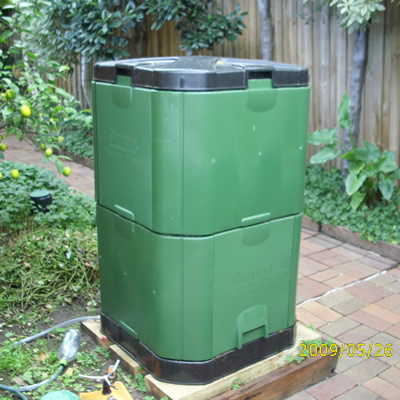 Capacity: 400 liters, 113 gallons. 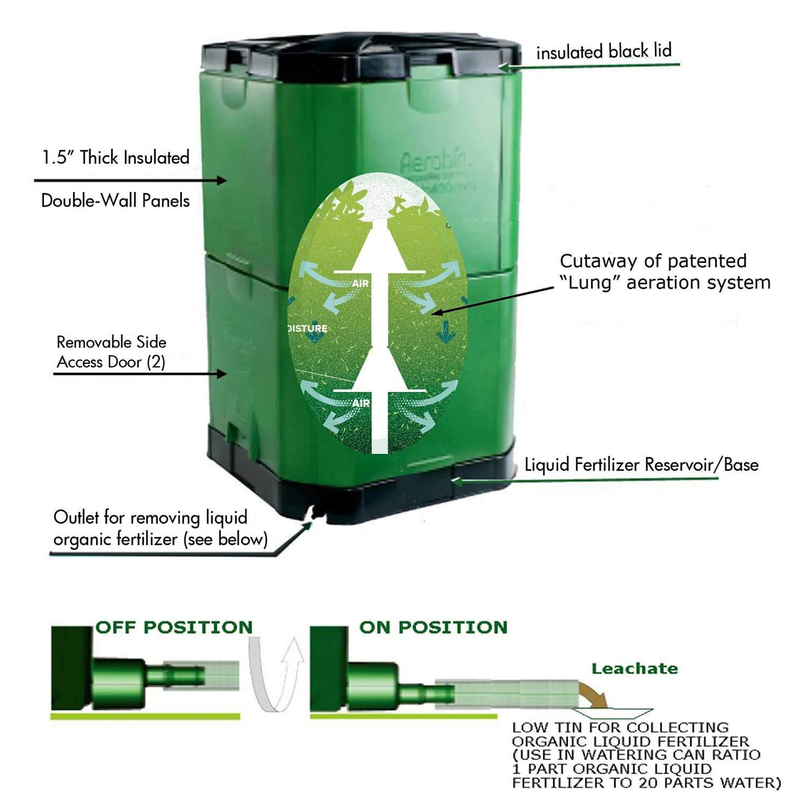 Insulated side walls and lid for year round operation - both to retain heat generated by the aerobic composting process and stop cold ambient air reaching the biomass. 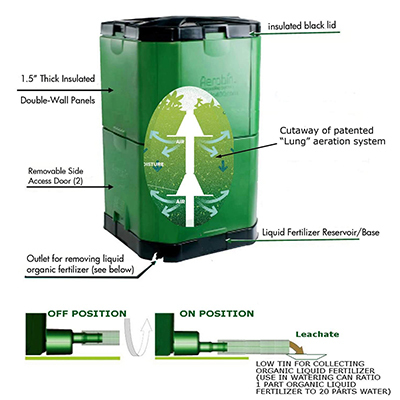 It has a base and a Leachate Tank for collection of liquid nutrients dispelled from the biomass (green waste). No turning or agitating of the biomass is necessary - simply drop and forget! Size of Article (L x W x H): 29" x 29" x47"
Kind of Palette: 40" x 48"
Size of Master Carton box 1: 9.7" x 29.5" x 29.3"
Size of Master Carton box 2: 22" x 28.8" x 25"
Unfortunately several of the tabs which are required to snap the sides in place were broken off on arrival. I had to use machine screws to secure the sides together. There should really be better quality control on such an important part of the unit prior to packaging. Looking forward to seeing how it performs. I am sorry your Aerobin arrived with damaged parts. We will gladly replace any parts for you that may be broken during shipping. Please let us know if you need anything at all. 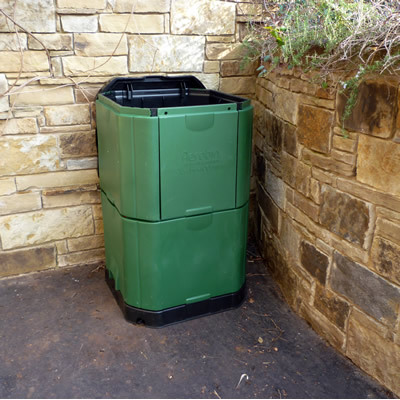 Can the Aerobin 400 be left in the sun without damaging the bin or is shade required? 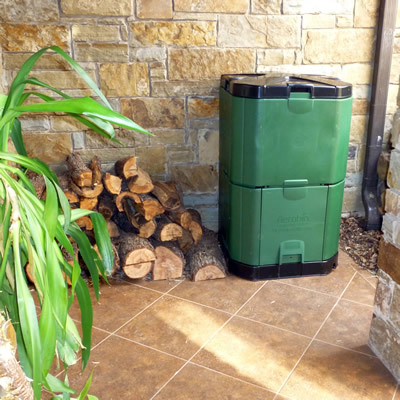 Due to the unique high design with the double insulated walls the Aerobin composter does not need to stand in the sun (to get warm) – it will work very well in the shade. 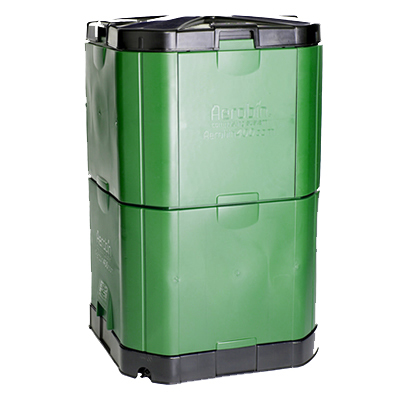 As such it is recommended to place the Aerobin not in direct sunlight – the less direct sunlight one has on a plastic container the longer the container lasts. In direct sunlight I expect the Aerobing to last at least 10 years but in the shade it will be double that. I love my aerobin and it's served me well through my first season. You mention on the site that the leachate can be diluted and used as fertilizer. What ratio of water should I use to dilute it? The standard ratio is 10 to 1 (10 x more water).